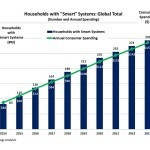 BOSTON--(BUSINESS WIRE)--The global smart home market ended on an upbeat note in 2017 reaching $84 billion, up 16% from $72 billion in 2016 according to a report just released by Strategy Analytics . According to the report, “ 2018 Global Smart Home Market Forecast ”, worldwide consumer spending on smart home devices, systems and services will total nearly $96 billion in 2018 and grow at 10% CAGR over the forecast period (2018 to 2023) to $155 billion. North America will account for 41% of total spending or $40 billion, followed by the Asia-Pacific region at $26 billion and Western Europe at $17 billion. New offerings from big brand tech firms such as Amazon, Google (Nest), ADT and Samsung are driving adoption in North America. 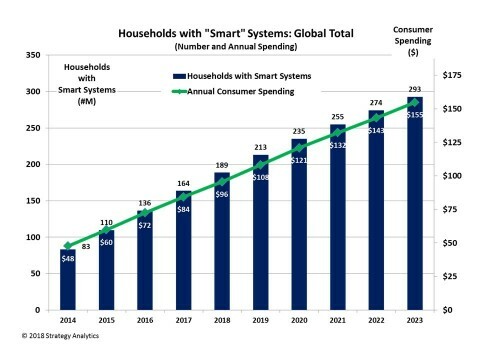 In Europe, UK-based Centrica Connected Homes’ Hive along with Deutsche Telekom’s Magenta Home, Germany’s eQ-3 and the Netherlands Enco’s Toon are stimulating market demand. In Asia-Pacific, China’s Xiaomi, Korean service provider LG U+, Japan’s iTSCOM and Panasonic, as well as, Origin and Telstra in Australia are powering the market.